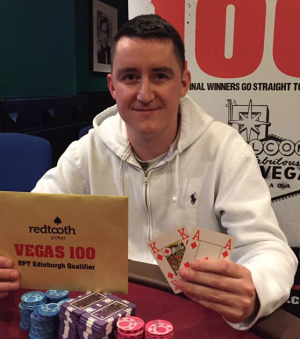 The Grosvenor Casino in Edinburgh brought the Redtooth Poker Tour to an end for another year with Liam Hamilton winning his second ever tour leg beating Dan Parsons heads-up. The RPT leaderboard once again went down to the wire with Mark Jones needing a first place to topple Danny Watson but ultimately fell short in 4th place. Danny Watson ends the tour with 3 Vegas tickets in the bag! Congratulations to Liam Hamilton who will be playing in his 2nd VEGAS100 final.